HOW WOULD YOU LIKE to have a secretary who will answer your phone and take messages at any hour of the day or night but who will demand no pay and no coffee breaks? Impossible, you say? 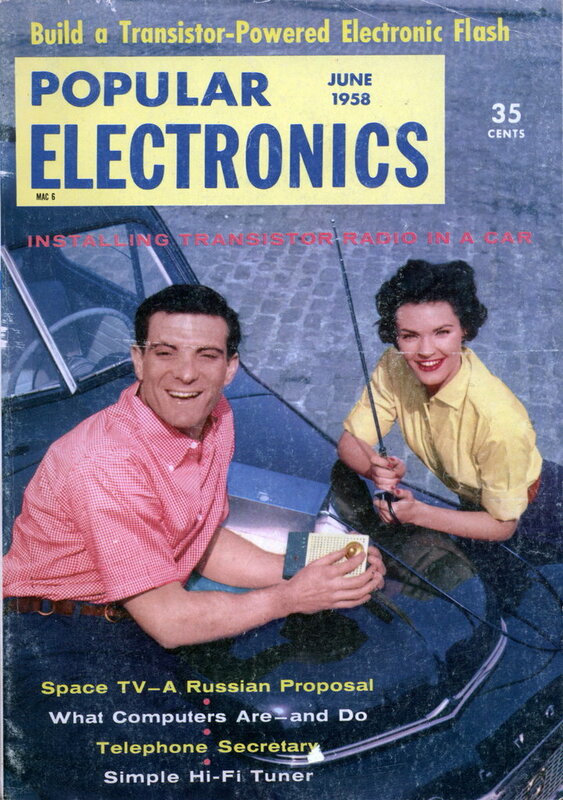 The miracle of electronics has all but removed the word “impossible” from the dictionary. There are two types of systems you can build which will do this job for you. The deluxe system requires two tape machines or one tape machine and one disc machineâ€” when a call comes in, it plays a recording of instructions and then switches over to record the message. The simpler type, to be described here, requires only one recorder and anyone who can put together a small amplifier can build it. Before you put it in service, tell all prospective callers to let the bell ring for 45 seconds (about 10 times). 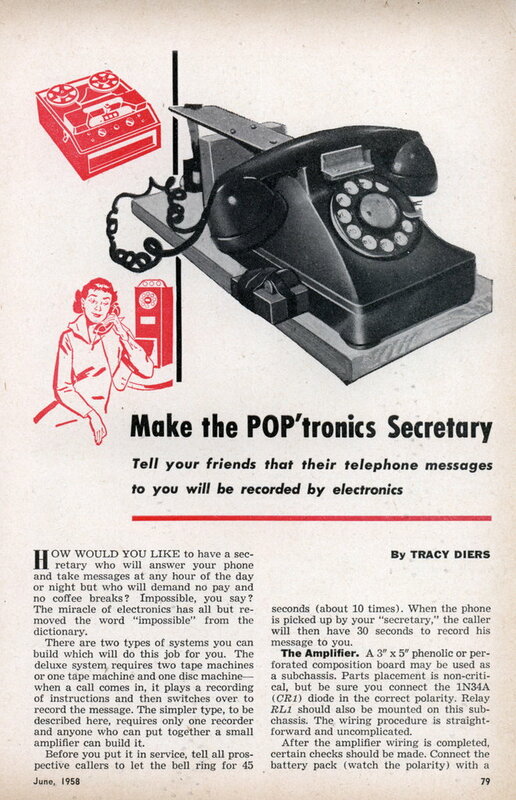 When the phone is picked up by your “secretary,” the caller will then have 30 seconds to record his message to you. The Amplifier. A 3″ x 5″ phenolic or perforated composition board may be used as a subchassis. Parts placement is non-critical, but be sure you connect the 1N34A (CR1) diode in the correct polarity. Relay RL1 should also be mounted on this sub-chassis. The wiring procedure is straightforward and uncomplicated. After the amplifier wiring is completed, certain checks should be made. Connect the battery pack (watch the polarity) with a milliammeter in series with the negative lead. The instant the connection is made, RL1 should close for two to three seconds. The current at that time should be about 5 or 6 ma. When RL1 opens, the meter will read about 0.75 ma. Bell Pickup Coil. Almost any choke coil will work, but the greater its inductance the more sensitive it will be. To adapt it for pickup service, you must realign the laminations so that they all point in the same directionâ€”forming an “E” with the coil on the center pole. Connect the pickup coil (CHI) to the amplifier with a 3′ to 4′ length of lamp cord wire. When you turn on the battery power to the amplifier, RL1 should close momentarily as before. Have someone call your telephone number and, while the bell is ringing, move CHI around the sides of the plastic telephone case until you find a spot where RL1 closes instantly each time the bell rings. Plastic tape will hold it in position. Main Chassis. A good chassis size is 10″ x 5″ x 3″, with the transistor subchassis mounted as shown. Four machine screws with Ms” sleeves or standoffs will keep the subchassis from making electrical contact to the main chassis. Bring all subchassis connections into the main chassis. The on-off switch (S1) can be mounted in any convenient spot. Mount a standard phone jack (J1) on the main chassis for plugging in the telephone bell pickup coil. Insulate J1 from the chassis with insulating shoulder washers. Chassis must not be used as a ground for either the transistor amplifier or timing circuitâ€” use insulated terminal lugs as common points and keep the ground of the amplifier separate from the ground of the main control unit. The thermal delay relay tube (RL3) plugs into a standard octal tube socket, and the two 7.5-volt batteries are held in place with a small metal strap as shown. Mount two standard a.c. female receptacles in one side of the chassis for the recorder and the handset lifterâ€”both of these operate on 117 volts a.c. Timing capacitors CI and C2 must be mounted on low-loss standoffs. If you can’t obtain the capacitance needed in a single unit, parallel several low-leakage types. Telephone Lifter. The solenoid actuator should be adjusted so that the solenoid plunger pulls completely in and lifts the phone handset about half an inch. You can mount the solenoid on a piece of sponge rubber to deaden its hum. While adjusting the lifter, temporarily tape down the telephone button switch. For the final test, plug the solenoid directly into the 117-volt line. The handset should pop up about half an inch, and when the line voltage is removed, it should drop back in place. Check it about a dozen times to be sure it is working dependably with a minimum of hum or vibration. Your Secretary. The transistor control unit must be located near the telephone to record when the power is supplied to it, and you are ready for operation. Arrange to have someone call you and watch what happens. The bell will ring, and each time it does, RL1 will close. After about 15 seconds, RL2 will close, and the recorder will start warming up, ready for the coming message. About 30 seconds later, when RL3 closes, the handset pops up, enabling the induction coil beneath the phone base to send the message through to the recorder. After about 30 seconds more the handset will go back in place, and the whole works will shut offâ€”all but the transistor amplifier which continues monitoring the telephone bell. You may have to experiment a few times to get the correct volume control setting for the tape or wire machine. You can change the timing sequences in your telephone secretary within certain limits. C2 controls the amount of times it will be necessary for the telephone bell to ring before relay RL2 pulls in. To increase this time, use a larger capacitor, perhaps another 100-wfd. unit. The values chosen were the result of many experiments and are a good compromise.